Chios. Mastic villages. Pyrgi. A medieval village, an experimental crop of mastic trees, and the edge of a hill slope. This is the backdrop that slowly reveals the Chios Mastic Museum – member of the Museum Network of the Piraeus Bank Group Cultural Foundation. A building volume well-camouflaged in its natural surroundings, with the unique point of access at the highest point of the land plot, gradually reveals itself to visitors as they almost sink into the landscape. Nothing hinders the panoramic view along a route through covered indoor and outdoor spaces. The entire route is designed to create a subconsciously predetermined, interactive itinerary through the history of mastic. A symbolic journey that revives traditional cultivation techniques, the process of industrialization, and commercial development over time. The museum’s building consist of two parallel wings, half-submerged into the ground, which follow the natural slope of the hill. 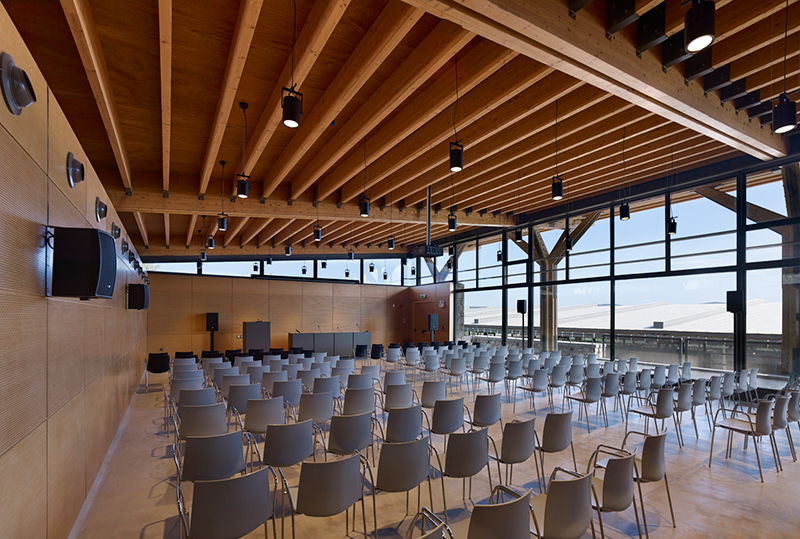 Both wings are covered by large wooden roofs that also incline towards the slope. Visitors commence their tour of the premises on the upper wing, through the covered passage between the ticket office and the multi-use venue. Then on to the lower wing, which houses the permanent exhibition space. 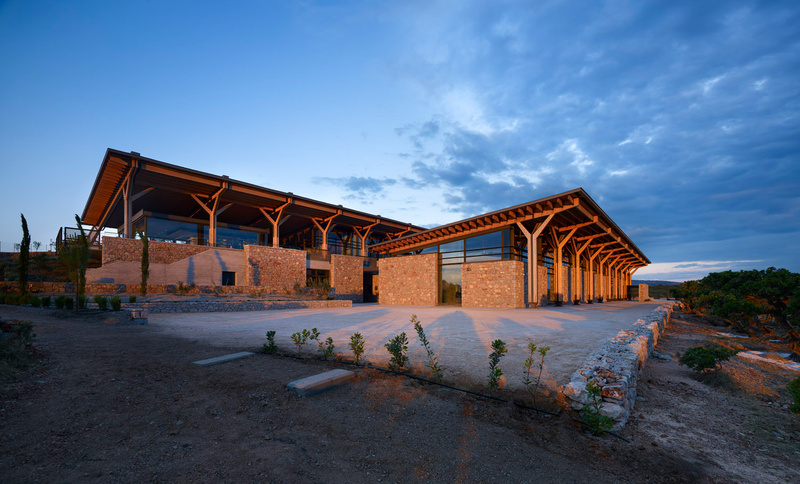 This is divided into sequential exhibition halls, in complete harmony with their architectural features: the first section, devoted to traditional cultivation, is in direct visual contact with the mastic tree grove outside, through the large glass surfaces on both sides of the building. The history of the mastic crop is presented in halls with low, atmospheric lighting or in darkness, while the industrialization story, which includes a display of the impressive equipment of the first factory, is housed in a double-hight hall where the production line offers visitors an interactive experience. A visit to the museum expands with a walk outside, through the mastic trees. 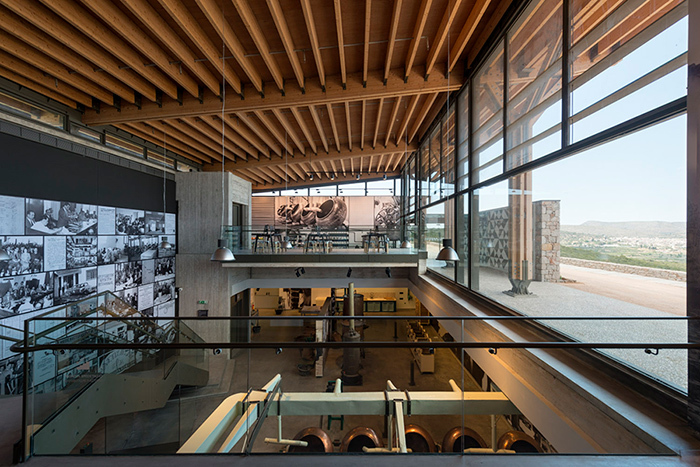 Ultimately, the museum’s design provides a lived experience that leads effortlessly to an understanding of the function and unique character of the mastic tree.